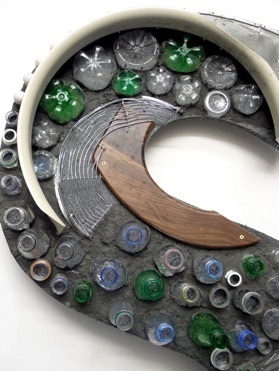 Michelle created this wall-based relief sculpture as part of the Seneca Wall project. The project led to the creation of a 508-ft long recycling-inspired mural on the wall of the recycling facility in Wembley, which was created in a bid to tackle a graffiti problem at the site, and includes work by a variety of artists. 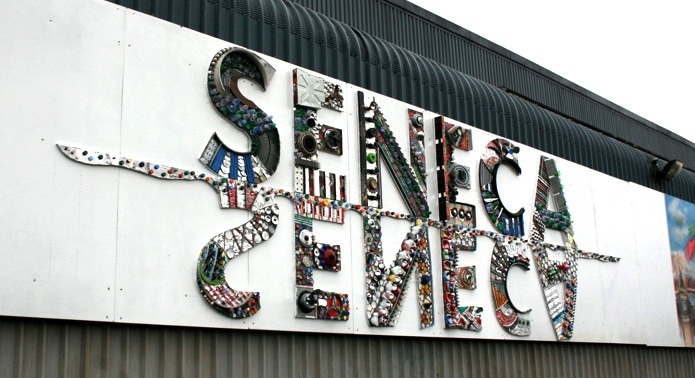 The letters are made up of a variety of materials which represent the range of waste processed by Seneca, built onto a base of Ecosheet (a sheet material made from compressed plastic waste). The word Seneca is reflected across a mirror or horizon line. The way the materials are used reflect the lifecycle of a material and its potential for re-use, and the reflection of the word represents Seneca’s ‘cradle-to-cradle’ approach. The reflected letters below the mirror line are an interpretation created with the help of local schoolchildren, which encouraged them to think creatively about what happens to our waste.